If you are a business owner, then chances are you’ve considered different methods for advertising. Maybe you are used to the traditional print advertising method, where people view your ads in publications or in newspapers. Maybe you aren’t accustomed to the new wave in advertising that centers around mobile graphics. If not, there’s nothing to fear. Part of being a business owner involves taking risks and trying new approaches. At Apple Graphics, we can help you take the guess-work out of your advertising process. Our team of talented installation technicians is here to help you on the journey of becoming a more astute business owner, and part of that process involves the way we handle our client requests. Our team works in-house to help you create a solid design from the start, and we’re with you every step of the way to help you create an advertising logo that works well for your individualized needs. Vehicle graphics are great advertising options for a variety of reasons. First, they are cost-effective and can be installed within hours. Second, they are mobile billboards that pay back their cost almost instantly. Third, vehicle graphics are both versatile and unique. You can make them as elaborate or as simple as you choose. At Apple Graphics, our installation team is here to make sure that you love your design, from start to finish. We can answer any questions that you might have about the process, and we can help you decide on the best design for your unique needs. Mobile graphics are not just cost-effective and eye-catching. They can be the difference between a mediocre business that only turns out a particular dollar amount in a month, to an award winning, top-notch business that can barely keep up with its client demands. Which business owner would you prefer to be? 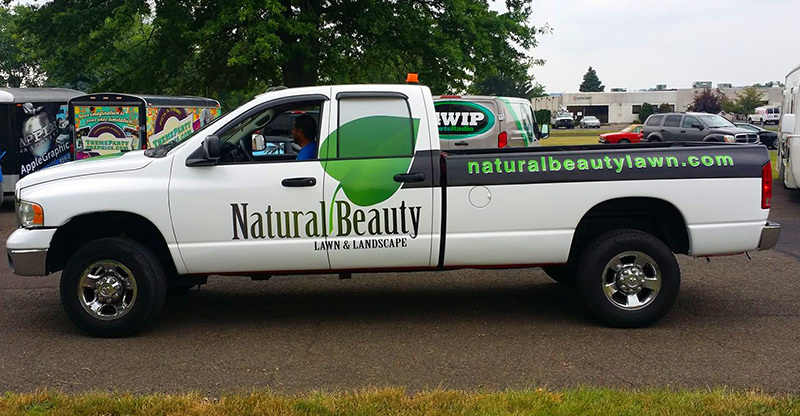 We know that it takes both dedication and creativity to make a vehicle graphic that catches someone’s eye. That’s why we only employ industry leaders. Our installation technicians will make sure that your project receives the attention it deserves. They will also answer any questions that might pop up through the life of the project. The next time you want to up your advertising game, make a call to Apple Graphics. We’re here to help you make mobile advertising second nature for your personal business.